Ok, who’s already shocked by the photo?! Where’s the sugar, frosting, and sprinkles?! This week I’m finally getting around to posting about some of my favorite fancy-looking appetizers and even though they aren’t a dessert, they are a favorite and had to be shared. 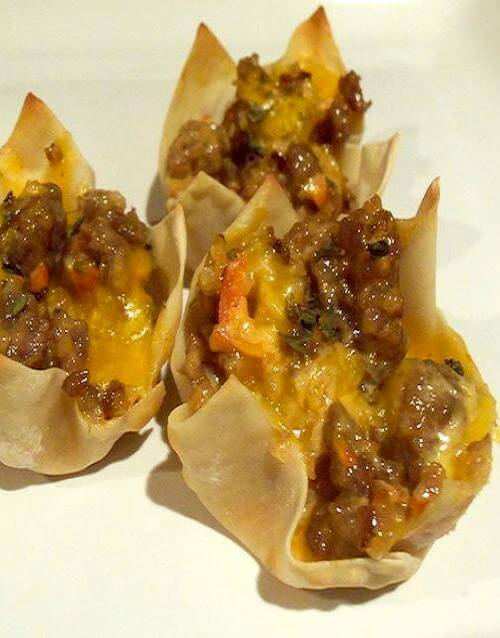 This cute crunchy cups from Renae Chiovaro are stuffed with a cheesy Johnsonville Italian Sausage filling that kids of all ages enjoy.They are perfect for game night, new years, baby showers, birthday parties, ladies night, product shows..just about anywhere. Printed the Italian Sausage Wonton Appetizer by R. Chiovaro but not baking instructions were included. Any suggestions? ?